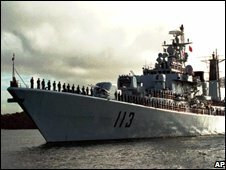 China is considering sending ships to fight pirates off the Horn of Africa in what would be the country’s first significant long-range naval combat mission since the 15th century. Since late October, more than 30 ships have been attacked by pirates based in Somalia and up to 19 vessels captured. These include a Chinese fishing vessel with 30 crew seized off the coast of Yemen on Tuesday. It was freed on Wednesday by a “multilateral force”, according to Xinhua, the official news agency. The UN Security Council on Tuesday authorised states to conduct land and air attacks on pirate bases in Somalia. This follows the sending by Nato of ships to accompany World Food Programme vessels. The European Union, India, Russia and the US have also sent ships and helicopters on anti-piracy missions to the area. Beijing in recent years has tried to placate foreign fears over its military expansion by claiming it is pursing a “peaceful rise” as a power. Other than for a 2002 global tour and a handful of port calls to the US and Europe over the past decade, China’s navy has not ventured far out to sea since the 15th century voyages around the world undertaken by Zheng He, the country’s most famous explorer. But the country is increasing military spending at 15-20 per cent a year and the US and Japan believe it is developing a blue-water navy. A senior defence official told the FT in November that China wanted eventually to be able to add aircraft carriers to its navy, although he emphasised Beijing would “not use [an aircraft carrier] to pursue global deployment or global reach”. Any Chinese anti-piracy operation is expected to be small and observers doubt Beijing would be comfortable taking part in a bigger international operation if it carried a significant risk of combat, even under a UN mandate. You are currently browsing the archives for the Islamist category.